“I would be there to be fair to any citizen in our community,” England said, further explaining that he knows of instances in the past when “juveniles related to the Sheriff’s Office” have gotten away with breaking the law and not being prosecuted. The question was also posed to Bellevue Marshal Larry Clark, who is running as a write-in candidate. “I wouldn’t say that anything is broken in the office, but I would say there are areas for improvement,” England said, further explaining that law enforcement coverage needs to be improved in the more remote areas of the county. “There’s nothing broken, but there’s always room for improvement,” Ramsey said. 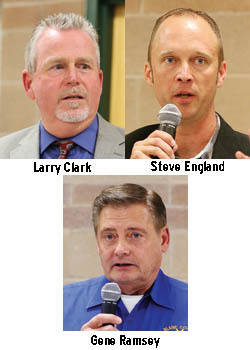 The candidates were then asked what effect they thought Clark’s candidacy as a write-in candidate would have on the election outcome. Clark ran in the May primary as a Republican but was defeated by Ramsey by more than a 2-1 margin and then filed as a write-candidate for the post in August. He did not elaborate on why some people are mad at him. “I was hoping that would come up,” said Clark about his candidacy. He explained that only about 800 people voted in the primary election, when only registered Republican were allowed to vote, but that the county has about 14,000 registered voters. Clark said that after the primary election, he was told by people that they would have voted for him if they had been allowed to vote in the primary. “The whole county has a right to vote for the sheriff,” Clark said. In explaining his platform, England, a 15-year police veteran, said he would improve community trust in the Sheriff’s Office by hiring a full-time victims advocate and a full-time community police representative. Ramsey, who was appointed sheriff when former Sheriff Walt Femling retired in 2010, said being sheriff is a complicated position and he is the only candidate with the right experience. Clark stressed that he also has management and leadership service with his 20 years in the U.S. Navy and 10 years of law enforcement experience. He further said the sheriff’s position should not be politicized.